September and October in Zambia are beautiful. Though we haven’t had rain in months and it’s really heating up, we can tell that the trees, plants, and grass are coming out of hibernation. It’s really amazing. No rain and lots of heat, but flowers are everywhere – covering trees, bushes, vines, and the ground. Barren trees are getting their bright green leaves back. I love this time of year! The jacarandas especially are absolutely COVERED in brilliant purple blossoms, and the ground underneath them gets coated in a lush purple carpet. 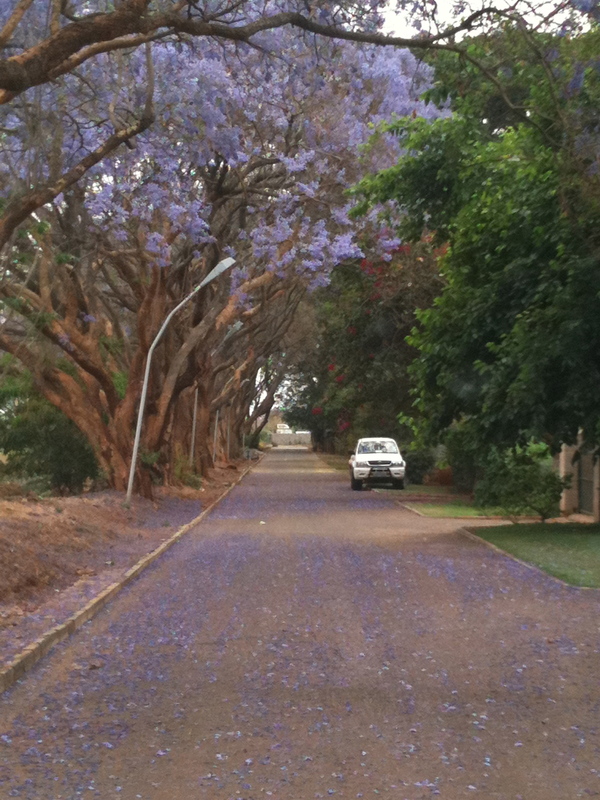 Jacarandas are something like lilac bushes on major steroids…and they’re all over Zambia. If you can stand the heat, now is a beautiful time to visit Zambia! Oh my – that is beautiful. I’m sure if C.S. Lewis had been to Africa those lovely trees would be in the Chronicles of Narnia. They look so story-like. Just another blessing whisper of God’s great love. These are all over Southern California, especially in my neighborhood. They are stunning!